Finally, I have been invited to switch to Yahoo's new mail interface. They seem to be inviting people to switch over little by little. I don't know how they choose who goes first, but it probably helps to add yourself to their waitlist. I am a long-time Yahoo Mail user, but when Google's Gmail came out over a year ago, I found it much easier to use and started using it as my primary email account. I love how Gmail manages conversations and lets you tag emails so that you can classify them many different ways. 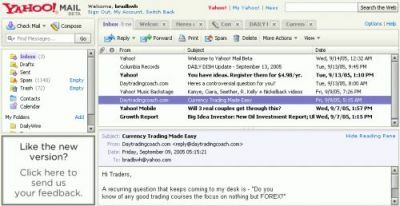 With its use of the much hyped web technology, Ajax, Gmail made is possible to read email so much faster than with Yahoo. I guess Yahoo had no choice but to respond. Yahoo explained that I could try out the new user interface without giving up the ability to revert to the old one if I didn't like it. I had nothing to lose, so I jumped right in. The first thing it told me was that I was using an unsupported operating system - I was using Firefox on Gentoo Linux. C'mon, Yahoo, I expected more from you. Fortunately, it said that I could continue at my own risk. If it flat out denied me, like some brain-dead sites do, I would have just used the Firefox User Agent Switcher Extension to pretend I'm using Internet Explorer on Windows. Even though Yahoo doesn't claim to support Linux, the new mail interface seemed to work fine without any problems. I think I might like the new Yahoo Mail better than Gmail. It is definitely an improvement over the old Yahoo Mail. That's for sure. The user interface is very similar to Microsoft Outlook so Outlook users will feel right at home. It lets you see your inbox and read an email at the same time. You can move from one message to the next just by pressing your up and down arrow key. You can delete and mark messages as read or unread with simple keyboard shortcuts or from right-click context sensitive menus. You can drag and drop messages from one folder to another. If Yahoo adds message tagging and threaded viewing of the messages, it may just win me back from using Gmail as my primary email application. Good job, Yahoo. Crazy! I just posted about email. I have been using Thunderbird and it is great. I signed up for the mail beta.. I hope I get to try it! I like Thunderbird a lot too. Unfortunately I haven't been able to use it in a while because my new company uses Microsoft Exchange and all the employees are supposed to use Outlook.